Mid-afternoon on Sunday and the pub is quiet. Elgood's - Primates of the Caribbean 5.00 A dark Best Bitter. Fruity and a little bit spicy. Lunchtime a few at the bar and a group dining. Second stop today whilst on a turnaround of the X21 Upminster to Ongar route, a few others I recognised from the bus had the same idea as me. Harvey's - Sussex Best Bitter 4.00 All the expected Harveys expectations! Lunchtime visit and I find an old friend, Ron A, at one of the tables. My run of bad luck regarding beer quality at this pub continues. Elgood's - Beer Goggles 5.00 A bland-tasting Golden Ale in dull condition. Mid afternoon and a couple of groups leaving as I arrive, a few locals left around the bar area engaged in rather loud conversation. Harvey's - IPA 3.50 All the flavours I expected in spot on nick too. £3.40pp for the thrifty minded. Truman's - Blindside 4.30 Surprisingly good, fruity rich and hoppy golden ale @ £3.60 a pint for the thrifty minded. Busy late afternoon at this drinkers pub. Seating was a choice of tables or leather sofas around a centrally located log fire. Nethergate (was Nethergate Growler for a while then name reverted) - Stour Valley Gold 4.20 Malty with a slight sour kick, unsure if it's meant to taste like that. Mid-afternoon and quiet. I planned a longer visit than last week’s, but didn’t enjoy my pint and decided to explore further down the high street. I found I had 15 minutes or two hours to wait for a bus at the stop opposite (I really should check these things in advance), so this was a rather brief visit to what is clearly a very decent boozer. Dark Revolution - Atomic 3.80 A cloudy, golden, fruity Pale Ale. 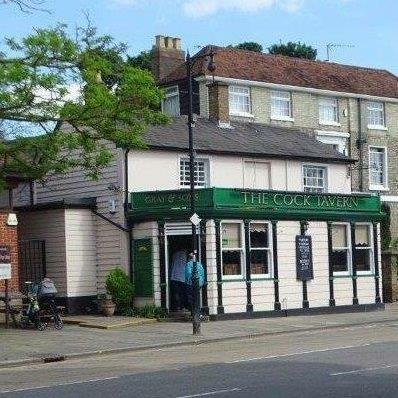 The pub is found in Ongar (or Chipping Ongar), Essex, CM5 9AB. A Grade II-listed, weatherboarded pub on the high street in Chipping Ongar. Inside there is a single room, with low ceiling and wooden beams. There is a real fire in season, and a couple of outside benches. Has a good reputation for its real ales. We have visited this pub 7 times, seen 17 different beers and tried 8 of them.